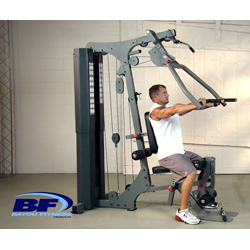 The Bayou Fitness E-Series Commercial Rated Home Gym E-8620 allows you to receive an in depth workout of major muscles groups. Ultra-thick 3" cushions offer support while upper and lower body workouts are performed. Excellent back work is provided by an easy to grip lat pull down bar. Chest press capabilities allow for development of a stronger chest, while 9 adjustments on the press and 10 vertical settings on the seat pad provide superb customization. Add tone to the arms and give the biceps a great workout with the curl/short bar. High, mid, and low pulley stations produce ergonomic, efficient workouts. Enhance your lower body with the leg curl/extension station. 4.33" vinyl covered roll pads let you exercise with comfort. Pivoting leg curl rollers keep legs comfortable as you increase leg tone, and an Ab Strap offers superb core work. The Bayou Fitness E-Series Commercial Rated Home Gym E-8620 was made with outstanding craftsmanship, coming with 11 Gauge steel and a light commercial rating. Assembled dimensions: 75" x 49" x 83.5"